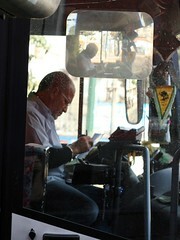 In Israel, women are segregated from men on 30 public bus routes, reports the BBC. The service has been requested by segments of Israel’s population of Orthodox Jews. Although the article doesn’t mention it, a woman was recently beaten up on one of these “modesty” buses, for sitting in the men’s section at the front. Husbands left heavily pregnant wives or spouses struggling with prams and pushchairs to fend for themselves as they and all other male passengers got on at the front of the bus. Because “no contact” between men and women obviously means men are allowed to “push” women who don’t do what they’re told. Interestingly, but not unsurprisingly, women within the Orthodox community are fighting back, and have launched a law suit against the bus companies that run segregated services. Keep your eyes open for more on this subject, as I’m working on a feature about the feminist movement in Israel’s Orthodox community right now, which should appear this summer.